Futureshock & Steem : The future is yours! We have definitely taken strides in blockchain technologies in the past few years, and all of that will soon become a giant leap for everyone! In the year 1970, the term “future shock” was defined by two futurists, Alvin and Heidi Toffler as a state of certain psychological state of individuals and the entire societies. A short explanation of the concept, in their own words, is: “too much change in too short a period of time”. This especially affects those born before 80-90’s, because of the digital revolution that happened within their lifetime, changing how they lived day by day. A revolution from an industrial society to a "super-industrial society". This change overwhelmed people, leaving them disconnected and suffering from "shattering stress and disorientation"—future shocked. What about the next generations? Once people were future shocked, and went through a revolution passing from an industrial society to a super industrial society. We are aware that a sort of “virus” is being spread that it will cause another future shock. That is represented by the technology of Blockchain. The Digitalization and Tokenization of everything, with the main aim bringing about decentralization through the blockchain. At this moment, all around the world, countless projects are being finalized that use the blockchain and the technologies it has brought about, without knowing truly what the future will bring, but definitely a revolution with a lot of changes is coming. We are a part of that change. We are creating that change! Futureshock is an Incubator with awesome, multi-skilled members from all over the world. Experience and an intelligent approach to situations is their defining characteristic. Members of Futureshock work for projects on the blockchain, enabling a giant leap for everyone, and a revolution on many sectors. We bet that in the future, you will be greatly shocked by the changes that our Incubator and team members are working toward. 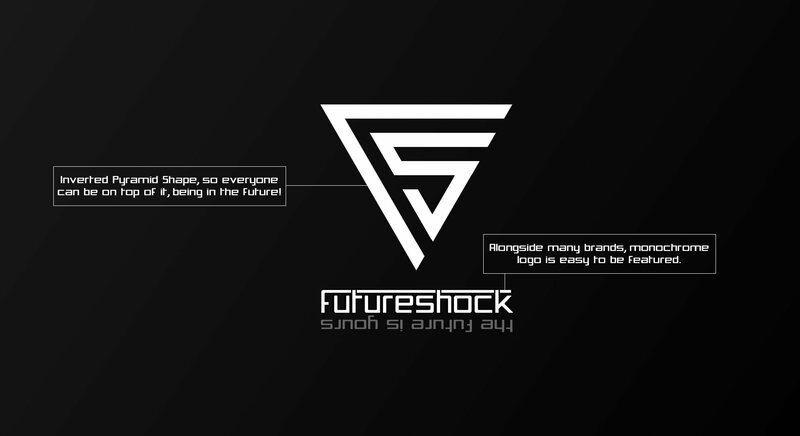 The Futureshock Incubator, with its talented members, brings futuristic ideas to fruition, by looking towards tomorrow and hacking the reality, grabbing ideas to work on, co-founding and growing them into projects, from concept to the first line of code, to a company and to a brand. Our heart is set on true progress, and making a great impact on your future life. This is how we will achieve our vision, of realizing a futuristic ideology that will be impactful on our future. 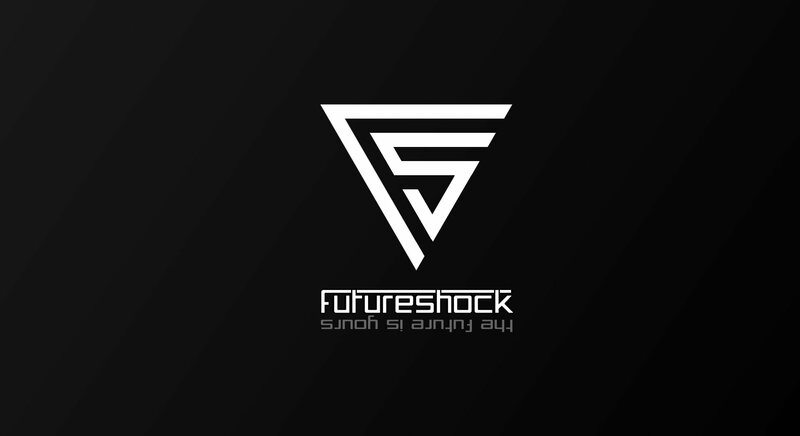 Futureshock Incubator was found in February 2018. Since then the team has dedicated itself to work on futuristic projects, and its continuing the hard work, to make the future better and to add value to the ecosystem of Steem blockchain. Fundition is the first decentralized crowdfunding and collaboration platform built on Steem Blockchain. The main idea behind Fundition is to connect Backers and Founders, and exclude the intermediaries. So the backers can donate with main cryptocurrencies, Steem/SBD, by using steemconnect, or they can upvote on the Steem Blockchain to the updates of the projects by Founders. Moreover the whole procedure is made without spending any fee, not even a fraction of a percentage, because Fundition does not take any fee. What we plan to activate? 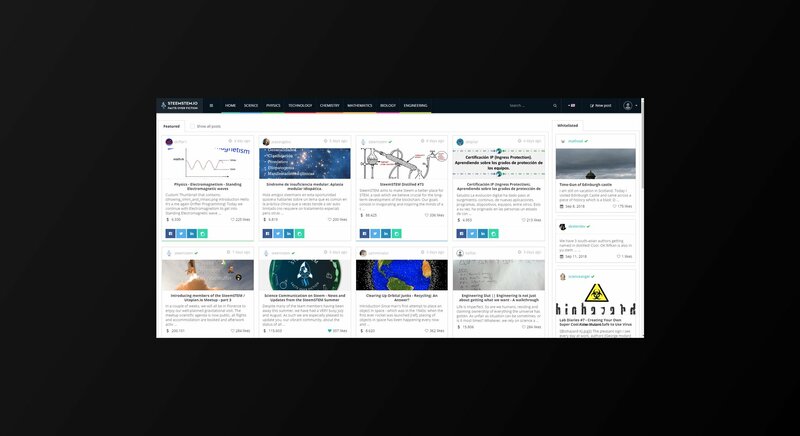 SteemStem.io (@steemstem) is an open source web application which aim to offer a space where both STEM professionals and passionate bloggers can freely distribute their knowledge in a social media environment that actively promotes and rewards them. With one long-term goal being to incentivise the direct communication between experts and interested viewers; helping to reduce the number of inaccuracies in reporting of STEM content, generated by journalists' interpretations of data, that are so prevalent today. Teelkee is the next-generation, decentralized Dapp builder platform on the Steem Blockchain. 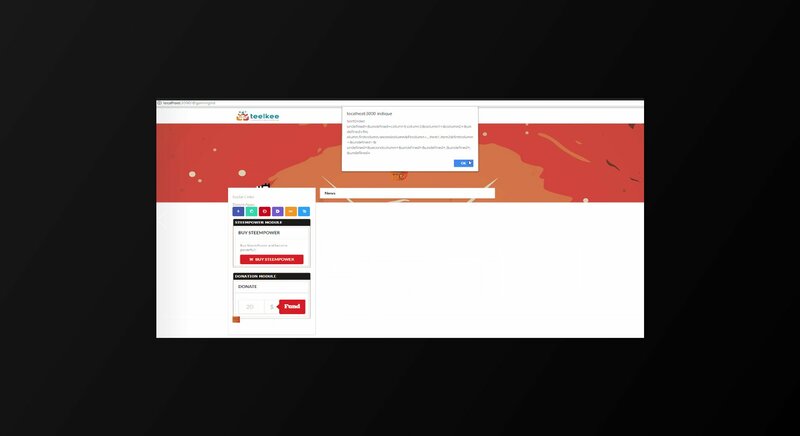 Or the first CMS ( Content Management System ) that will work on top of the Steem Blockchain. FactIt is a decentralized platform dedicated to debate,verify or deny facts in a collaborative way. 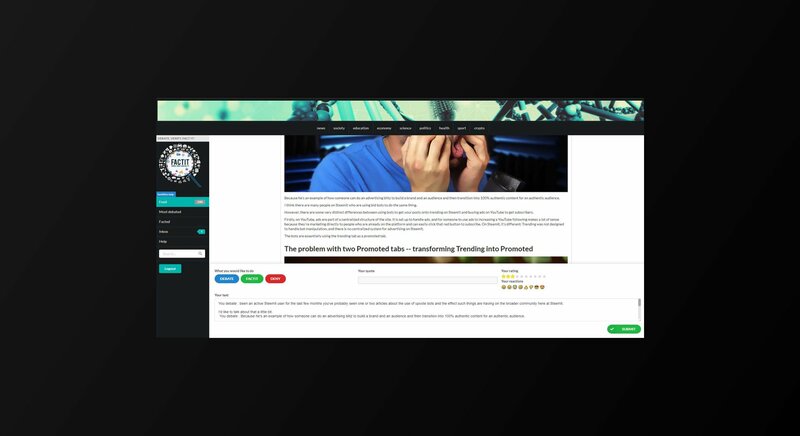 Built on the powerful Steem Blockchain, FactIt is the first immutable platform allowing to check the veracity of a fact by sourcing and gathering many types of information. Dedicated to gaming, Ongame is a gaming platform which combines the power of the largest social Blockchain, Steem, and the largest gaming platform Steam. Players, testers, game creators, and many others will have a new way to monetize their content and interact with their network/friends. Are you looking for job position? We are looking for Developers that know how Steem Blockchain works, to continue with our projects as mentioned above. Great to see more development on the blockchain and some very interesting concepts. I think that since gaming is such a massive industry at the moment it would be a great project to link with blockchain technology. The next generation has grown up with games and technology so it would be a great place to draw from in getting more people involved on the blockchain and getting it's use up. It's also nice to see a group drawing up some long term plans and communicating with the users here. This is what we need more of. Good projects, long term vision and keeping people informed. We'll done. Hello good day @futureshock please I'm writing to directly solisit for delegated partnership. I'm starting a show which I will be doing on a weekly basis here on steemit. The show is going to be published on @Dtube and also feature amazing steemians who have worked hard and earned themselves a place here on the platform thereby promoting steemit and also encouraging minnows that they too can make it here. In order for this to be a reality we need help and support from great whales like yourself who can delegate SP to help give us the visibility requuired to push it on the steel platform. I believe we cannot do this alone, one to another we can make an impact. I look forward to hearing for you sir. What to say? This is a great Team investing their Future in the Blockchain... I have the pleasure to know some of them because of Fundition, but the entire picture is just Shocking! Congrats to each member of this Team! Did you already try Binance? Indeed, the future looks bright. Love the inverted pyramid where everyone is on top of it! Is on top of it! Do you need any staff for supporting roles outside of developers? You got a 30.11% upvote from @postpromoter courtesy of @hightouch! Wow great team of people. Great projects ! If you need some financial or « classical » entrepreneurial skills please contact me ;). These are quite a few projects you have and we knew only about Fundition. Thats it what Steem needs great developers with a great vision of the future. Thanks for your good work! We need more of this innovations. Nice work buddy, I am not a developer but wrote an article on steem a couple of days ago in which i tried to descibe it. if you have time could you check it out and let me know what you think? Learnt so much. Future shock; it always amazes me how some people correctly predict future events. Great informative news, exciting for all of us steem users. Hello guys, I just want to share this big event of Kucoin, Kucoin Anniversary Giveaway just click the link for more info. Goodluck guys! It sounds like an interesting concept to prepare others for a long term future definitely worth observing.